Lars Boom was first today but Vincenzo Nibali was the winner. It’s only Wednesday and already the Tour de France has seen enough drama to fill an HBO series. Today’s been too big to keep the stage wrap for tomorrow so here’s some thoughts on events. The stage started before the racing began. Most will have woken up this morning and opened the curtains in their hotels to see the rain and groaned but perhaps Tour boss Christian Prudhomme smiled? The tension started rising with nervous tweets from many riders but few complaints. Everyone had a right to be stressed by the roads ahead. 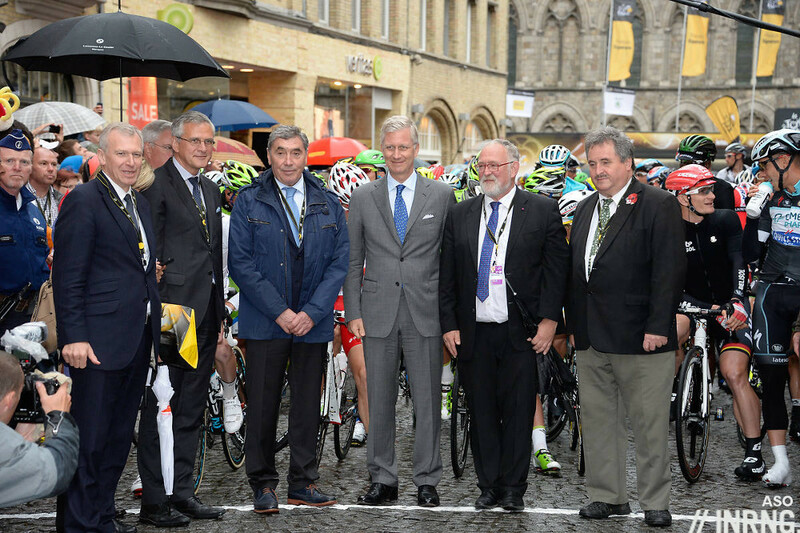 The riders assembled in Ypres where King Philip I and Eddy Merckx, a combo of royalty, saw them off. The Menin Gate and a start by a war cemetery to remember the death of approximately 500,000 was a strong enough message to help us avoid metaphors of war in sports coverage, talk of battles and combat for a mere bicycle race put things in perspective. Two cobbled sectors were scratched from the course such was the flooding due to the rain. With hindsight it made no difference to the race although presumably it could have been worse for some. Certainly there were enough of the pavé. But we didn’t need the cobbles for drama. After the first break went the pace didn’t drop with the bunch covering close to 50 kilometres in the first hour and a nervous time in the bunch. Chris Froome fell, this time his right side showed white flesh through the torn black kit. But he seemed fine, he was back on the bike and even out of the saddle, something that’s not easy with a bad wrist. But it was long until he crashed again. Yes he didn’t need the cobbles to crash but the cobbles on the stage surely added to the tension and speed which in turn added to the crash risk. The accident wasn’t caught on camera but we see him standing by the side of the road and it was clear something was wrong. Hunched forward he started to hobble, the instinct to get back on the bike clearly countered by the pain. Encircled by Team Sky staff he climbed into a car and with that his race was over. With one wrist in a brace he was struggling to control the bike and the latest this evening is that is that Richie Porte was anointed as team leader for the stage and given the “bodyguard” protection of Geraint Thomas. It’s the first time since Bernard Hinault in 1980 that a defending champion quits the Tour. If you’re a fan then it’s a sad moment and if you can’t stand the sight of him then you should be sad too because you won’t see your preferred rider challenge and perhaps beat him either. For neutrals it means the Alberto Contador duel’s over and we lose a GC contender. The Wiggins issue drags on but let’s put this away quickly. Even if Wiggins was riding we saw in the Tour de Suisse that he wasn’t riding well; plus he doesn’t have a forcefield either, he too crashed out of the Tour de Suisse and of course left the 2011 Tour with a broken collarbone too. But it’s not about the legs or bike-handling, the two don’t get on. Team Sky haven’t put them in a race together since Oman in early 2013 and as Dave Brailsford explains in The Cycling Podcast the risk is a team split in two or riven by tension rather than a united force. Richie Porte is Plan B and the word before today is that he’s flying. We’ll see in the mountains. Back to today’s racing and Vincenzo Nibali and the Astana team ruled the roost with all his rivals stuck in various ways. Jurgen Van Den Broeck was the best off, now sitting 1.45 behind Nibali but he crashed today. Alberto Contador struggled with the pavé. After the stage Bjarne Riis said there problems with his gears and given Oleg Tinkov’s regular tirades against SRAM the only question is whether the team ride Shimano or Campagnolo next year. But from the TV the Spaniard seemed to have problems with his trajectory, you could sense the nervousness. Alejandro Valverde was delayed and had the whole team pacing him back at one point and spend the rest of the stage playing catch-up. Many others were much further down, so much that the King of the Mountains competition could hot up now because several riders are dropped so far down the rankings they’ll have space to operate. But let’s not exaggerate the time differences. If anything the gaps on the GC now mean plenty of variety, riders will have space to attack and take risks. Lars Boom won the stage and behind Sep Vanmarcke was celebrating the triumph but Belkin’s Bauke Mollema came in 34th, 2.44 down. I don’t know the team plans but the outcome suggests the riders had varying ambitions. For what it’s worth Boom’s already linked to Sky for 2015 while Mollema’s said to be close to Orica-Greenedge. It could be far too soon to measure the impact of today’s stage. We know Nibali took time, we know some crashed . But we don’t know who is injured. Even superficially lost skin means losing sleep and reduced recovery, it adds up like compound interest over the three weeks. Nibali’s performance wasn’t just superior to his grand tour rivals because his third place today saw him finish ahead of Fabian Cancellara, Niki Terpstra and other classics specialists who had a free ticket to ride for themselves. The Sicilian won’t be rushing to ride Paris-Roubaix in 2015 but this underlines just what a good day he had. Better still, Astana collectively had a great day. Do cobbled stages have their place in a race like this? Yes but sparingly. Like climbing Mont Ventoux the Tour should do it from time to time but not as often as we’d like. Keeping a distance helps to preserve the myth. Otherwise it’s not as if the cobbles are a surprise and if you’ve got a phobia of the porphyry then go ride the Tour of Austria. Lars Boom won but Vincenzo Nibali’s the winner. However if today’s stage looked like Paris-Roubaix in reverse it is not Roubaix-Paris. It was just Stage 5 and Paris is almost 3,000km away. It’s too soon to tell what the outcome of this stage will be. We’ll see things unfold this week and events today will even send shockwaves that go beyond the Tour de France, for example the Vuelta is already looking mouthwatering with Chris Froome facing the Quintana brothers. Footnote: even my computer crashed today, the hard disk going the same way as Andy Schleck’s knee. A borrowed laptop should keep the show on the road but tomorrow’s stage preview is uncertain. Thought today was much more about luck than skill given the conditions. And whilst I absolutely enjoy the one day races over pave I’m not convinced it has a place in the tour. I’m not sure it’s in anyone’s interest to see the likes of Froome out and Contador so far back in the GC. 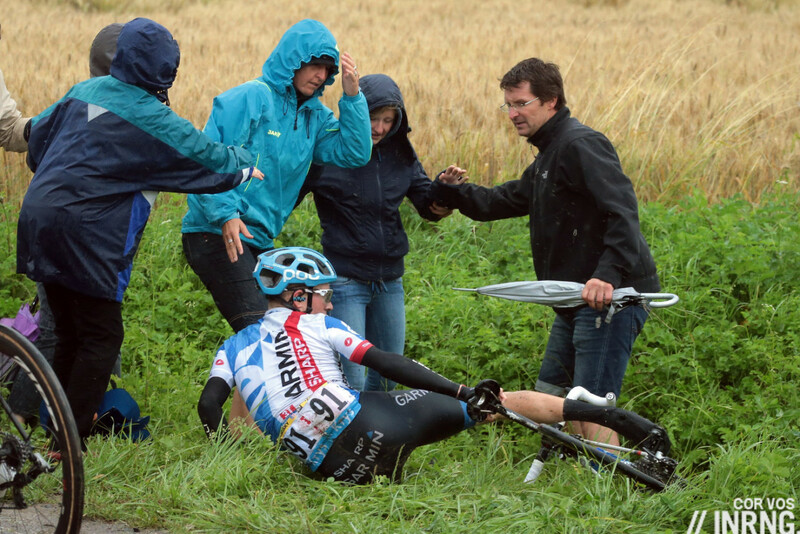 Yes I know that Froome went out on a roundabout but there was bound to be some tension about today’s stage given his fall yesterday and the type of stage he was having to face today. Who knows how much that affected his confidence going into today’s efforts. Having already lost out on the spectacle of OPQS and Cavendish taking on Giant Shimano the prospect of another couple of weeks of Nibali, Froome and Contador fighting wheel to wheel in the mountains has gone. 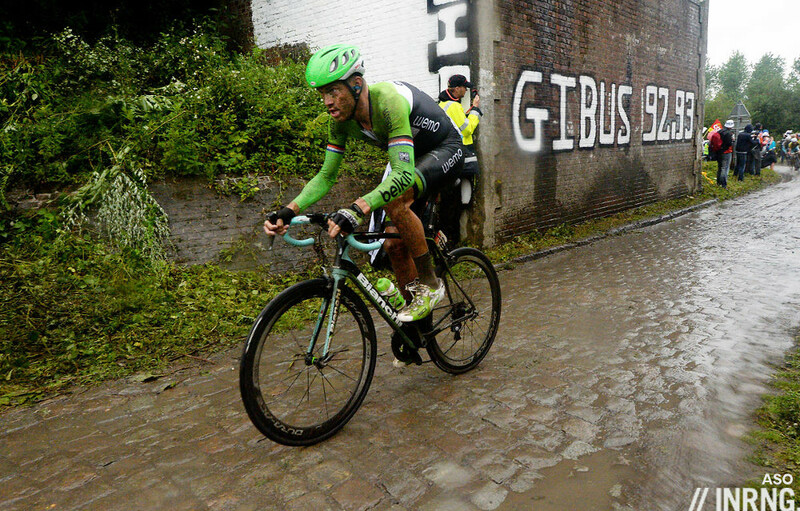 I can see the appeal of the cobbles as spectacle, especially in the rain. I’m just not convinced it has a place in the tour at least not on a regular basis. Of course it does. Winning the biggest race on the calendar should not just reward stratospheric W/kg. Bad luck can happen to anyone, at any stage in the Tour. Froome’s bad luck had nothing to do with the cobbles in the end. It happened yesterday when Keukeleire (I think) took out his front wheel. That led to wearing a cast today, and someone who isn’t renowned as a bike handler got a little bit worse. On the other hand, someone who IS renowned as a bike handler, showed everyone how to ride a bike. 100% with you there. You know what they say about luck – opportunity meeting preparation or something like that. Does any real fan of pro cycling take anything coming out of the mouths of TV’s Heckyl and Jeckyl seriously? This is not a new phenomenon. Paris-Roubaix cobbles have been sprinkled through various editions of the Tour for a very long time and this should continue. If anything, we should be talking about getting rid of time trials – the most boring aspect of this race and the one the contributes the most to negative, defensive racing (witness the Indurain era. Wiggo 2012 was the same – sorry Wiggo, you’re still a legend). Of course (most of) the GC riders hate them but speak to a sprinter climbing Ventoux or the Mortirolo. They’ll express the same emotion. Where is the debate about the difficulty of mountain stages for them? Is it unfair for sprinters to be made to ride up them? Riders get plenty of notice of these cobbled stages (approx 9 months) and therefore have plenty of opportunities to train and race in these conditions, dial-in equipment and get it right. There are no excuses. For the Tour to maintain its prestige and its spectacle, an occasional sprinkling of cobbles is a very good thing. I would argue that, for the Tour to gain something over the other 3 Grand Tours, and to perhaps proclaim itself as the race to identify the best cyclist in the world (road cyclist anyways), then they need to add a cobbles or a Tro Bro Leon route (as well as perhaps a TT route that is both flat, uphill, and on rough road (see the 2010 Giro uphill, dirt road time trial). I think too often, the Tour De France feels like the Chili’s of Grand Tours….Corporate, predictable, but for serious, true fans of cycling, lacks the racing we really want (2011 version an exception). Which are “the other 3 Grand Tours” ? The Giro, The Vuelta, yes…. …surely not the Tour of California !?!?!? I meant 2 Other Grand Tours…..no – I did not intend to somehow make claim that the Tour of California or US Pro Challenge are somehow equivalent races. My bad – beer and comments do not mix! Considering that ASO now owns the Vuelta, there’s only one other grand tour. The hilly day in Yorkshire and the cobbled stage are the only thing of GC interest at the TdF 2014. We know the rest of the race are a couple of power test stages and that’s all. 2014 is better than 2013 with only one stage where Contador made a race. I’d argue if things were dry the rider opinions would have been different, much more tepid like the last time they were included. FWIW, add some low-quality, narrow, asphalt and high quality dirt roads to the race too. The Giro does something like this and it makes good racing. One day of cobbles is enough. Indeed. The Tour has became a 3 week race for sprinters, climbers & tactics. In this way the gc field can open up a bit more. Today the weather conditions made it extra hard, but still. Now the race has completely opened up for underdogs and outsiders, and maybe we will get a more interesting Tour now. But too bad Froome had to give up. No one likes to see someone giving up months of training. Seems to me that the cobbles, and the weather, have given the fans a real boost. The only ones whingeing are the Sky fan boys and a few riders. The cobbles are a big part of cycling history, so it’s not like this is a dinky gimmick. We had cobbles in many Tours of the past, and as Inner Ring says the riders had a year to prepare. Surely being a good bike handler is an added string to the bow of the Tour winner. As an example, Froome is the tennis champion who can only win on generic indoor courts with perfect air conditioning, while the others win Grand Slam tournaments outside on grass and clay. Having the crawly stem-watching, uncertain and frankly ugly style of Froome put on a pedestal as “the best rider” doesn’t seem right to me. Meanwhile Nibali descends like a stone, fearless and gutsy in equal parts after yesterday’s effort. You can guess which Grand Tour winner I respect more. Cavendish taking out Gerrans with a desperate and selfish move has nothing to do with Froome abandoning, although I have a lot more respect for Froome who was clearly beaten up but had a good crack. After his first crash I would have forgiven him hopping into a car, but he got back on. Cavendish was fighting for 4th place at best that day, even with the entire OPQS riding for him. Watch the tape, Coquard was moving better on the outside and finished 4th. Questions need to be asked about him, he never came within a mile of challenging Kittel despite having an injury free run in. Are the multi-stage winning days of Cavendish well behind him? Will OPQS continue to base the Tour team around him? JV you are bang on. In the past LeMond rode the cobbles and deserves his legendary status. Whereas Froome and most of the modern GC world are one dimensional; Nibali has really gone up in my estimation following yesterday. Does it have a place in the tour? Hell yes. The tour should be showcasing the best riders not the best at watching a power meter. More unpaved stuff please ASO. I’m not a Sky fan boy, in fact for your information, I’m not even a boy. I didn’t say it shouldn’t be in the Tour at all, I said, for me, not on a regular basis. For one thing I think it takes the gloss off Paris-Roubaix (which is immense in my view and all the better because it is so unique) and gives some non GC contenders a different goal to aim for. I’m just suggesting that the cobble stages, especially in conditions like yesterday, have a higher likelihood of taking out GC contenders that I personally would like to see still contending at the end of the tour. A lot of things used to be in tours in the past such as mending your own bike and riding stages through the night, maybe we should bring those back too? But seriously, I have already acknowledged that Froome’s demise wasn’t directly connected with the cobbles. As for calling riders “whingeing” (given the conditions yesterday) that’s a little harsh especially as apart from Froome they all stuck it out. They are still entitled to have an opinion and to be fair I like their honesty, I think it gives a real insight into the conditions. My comment relating to Cavendish was that we will miss the opportunity to see how OPQS preparations to beat Giant Shimano would have panned out. That is disappointing irrespective whether it was Cavendish’s fault or not. Something, that personally I, along with seeing the main GC contenders fighting it out at the end of the tour, was looking forward to. But as they say “that’s racing” and I too will be rooting for Nibali I think it is his time to shine. So good on him for his performance yesterday. Wonder if David Millar had a big chuckle watching that one at home…? Due to missing the tour Millar cant laugh at anyone at the moment. Poor old dave is missing a big chunk of his ego massaging film hes having made about him. It should be a cracking two and a bit weeks. Contador theoretically edges the final time trial, which Porte isn’t too bad at either. Which should mean we see some attacking by some strong teams…and as strong as Astana were today they will have their work cut out for two weeks. Defending the Jersey from Stage 2 will be pretty epic. That said, I am rooting for Nibali – seems to have come good at the right time and he’s obviously a real hard man (after winning in the snow last year in the Giro). I still want to see Nibali, Quitana, Froome and Contador tete-a-tete in the next 12 months to get a real sense of who is the best…. Even better, maybe Wiggins finds a new team next year and we can find out whether Wiggins or Froome is better without any intra-team politics getting in the way. Based on today’s ride I would not put much money on Contador’s TT skills. Mud or not he looked weak and could not hang on to the chase group. Go and tell Nibali that his performance has been a matter of luck. I’m sorry but I don’t buy it. Nibali’s been absolutely impressive today, nobody could have predicted such a strong performance in an (apparently) strange enviroment for him. A milion miles away from his Tour rivals, but also beyond specialist. Cancellara, Sagan, Degenkolb, Krystoff, Van Avermaet… Yes, he has beaten all of them too. The Sicilian went for it from the first minute, full of conviction (unlike many of his peers in the bunch, so frightened today) and that may give him the Tour. Today seems like a good first step. Look at the picture above. If VDB had fallen right instead of left, Nibali would have been on the floor too. His commitment today and attack on stage 2 were both impressive, but little moments of luck like the direction another rider falls play their part too. The greats are simply able to make the most of their luck, and Nibali’s done that so far. don’t agree. you can see the riders were lined out and the fallen rider created a fork with riders going around him either side. Another example was when Iglinksy came off while leading Nibs into a corner. Although riding on his wheel Nibs still managed to brake to in the wet and make it around him with a foot down . The guy is just super impressive on a bike. He’s a champion, he knows to prey on other riders fears. He didn’t just aim to stay upright, he and Astana plotted how to hammer them. Each to their own, but it doesn’t change the point that a rider has no control over when and where other riders fall, or veer massively offline. I agree that Nibali is a good bike handler, but unless you can stay on the front all day, every day, there is an element of luck in not being taken out by another rider’s mishap. Nibali is one of the elite peloton’s great bike handlers and has been as far back as I can remember. Not just good, great. He took a great opportunity that was there and it worked out very well for him. Can he keep the lead until Paris? I doubt it. The jersey is heavy. We’re back to the same old power test stages after this. I’m sure there are plenty of guys in the Tour who feel like they should take the high mountains out of the race, as only a few guys can really climb those fast ….. The roads in Northern France are just as much a part of France as the Alps, so there is no reason why they shouldn’t be in the Tour. The riders knew they were there and knew they needed to prepare for them. It might have even been smart for a few of them to ride Roubaix in April just get a better experience. You could also argue that being 66kgs at 6’2″ might not be the smartest thing for the first week of this Tour. Its too skinny and too fragile. Agree. I don’t see this stage being any different than when the Schleck brothers were complaining about being out descended by Evans, Contador and Sanchez in 2011. I totally agree with your comment about keeping the myth of the cobbles and using them sparingly. I was supporting Froome but really enjoyed todays racing. I think the guy that wins any GT should be able to win over variable terrains and weather conditions. Did it look to anyone else that Sagan was soft peddaling towards the end? Was he not actively chasing his friend Nibali again? You do not need the cobbles to make it exciting. You can also have routes such as the route on Tro Bro Leon, or some more creative TT’s that require both flat and uphill roads. Again – mix it up. Froome dropping out is no more a bad thing than when a sprinter has to give up in the mountains. I don’t think so. There were no GC contenders arround (except Nibali) and the mistake Sagan admitted to do was to be on Cancellara’s wheel when the front trio attacked. Then it seemed too late to respond. BTW it is funny, how many excellent commentators tend not to regard Sagan as top sprinter or top classics rider. Of course they are wrong on both cases. Surely he is not among the most quick sprinters, but if (say) Cav or Greipel would achieve places 2-2-4 (I know: crashes, uphill finish, curves, wet …) in flat sprints behind the clear King Kittel, any of them would be declared to “crown prince” of flat sprinters. And if you have a look at top ten of Roubaix and stage 5, only two names overlap – Spartacus and Sagan. Anyway, the irony of that was that Wiggins seemed to be riding well for Froome, setting pace on the flat and lower slopes. Yes, 2013. Will fix that. It’s valid to include tough stages. The Tour de France is supposed to encompass a bike rider, that masters most terrain, and disciplines, time trial, climbs, fast stages, crosswinds, an all rounder, or as best as can be. It was a mistake, to remove cobbled sections of the stage, just because they were wet, or flooded. Weather, has always made road stages tough, Italy, France or Spain. It rains, snows, and sunshine, occurs. If you start “softening” the race, just because it’s a tough day, then you ultimately devalue the race. The weather, is part of bike racing. Gavia in 88, I concede, was extreme! Today, wasn’t on that scale. Yes, the weather is very much a part of bike racing. However, this wasn’t so much about the weather as the state of the roads (although that is, in this instance, a direct result of the weather). It is important to remember that cyclists are professionals – yes, they’re lucky to do what they love etc – but at the end of the day this is a job. They are contracted and paid to ride the Tour and this stage. They don’t have a choice. Therefore the organisers have a responsibility towards the safety of the riders. There is a difference between “softening” – that is, lowering the level of competition – and ensuring basic levels of safety are met. 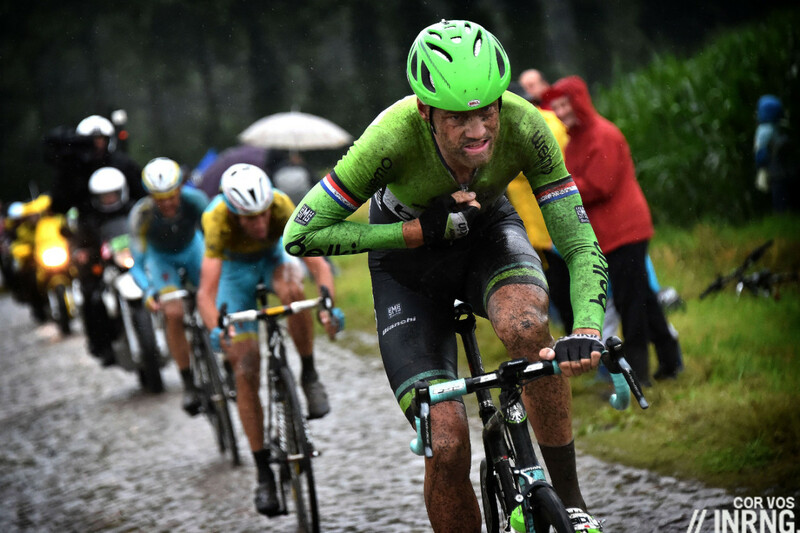 There was more than enough competition on the roads today, and flooded pave sections could have seen more than just Froome leaving with injuries potentially much worse. +1. I agree. Today’s stage was nothing but a medio fondo with several cobbled sections. I was amazed at how short the parcours was, and that they finished in 3 or so hours. Cancellara, while complaining how it should not be in the tour, conceded that his chances were hampered by removing the two sections. Exactly. If it was no doubt the best TdF stage of the 21st century, with Mons-en-Pévèle and appropriate mileage, it would have been even better. (Why is everybody saying this “it was already nough” thing? they can’t conceive of even better racing?). The cobbles should feature every year, they should be a staple all riders get used to. But why always on the week, when the peloton is all nervous, and there are a lot of contestants? The cobbles could be even more spectacular and decisive in the second or third weeks. That’s a great idea – I’d love to see a cobbled stage in the last week, perhaps on the penultimate day, rather than a time trial. As people have said above I think a grand tour should try and include a bit of everything: flat, winds, rolling hills, mountains, time trials and cobbles. As someone who rode the route before the race I can say the “good” roads were slick beyond belief at the speed of the day. Rain, oil and paint made for a skating rink. The pave section at Orchies had several points of deep standing water hiding large holes-fine for a solo sportive rider in the morning or the sharp end of a field strung out 200ish km from the start of Roubaix but not for a Tour peleton on a short fast stage. I certainly agree with pulling that section was the right call, if the same had been done during Roubaix then you could say it was “softening”. Thanks for this, I’d been expecting some riders to fall on the cobbles but it appeared many more were going down on the open roads. Every roundabout seemed to have an accident – I wondered about the reason for that. Great stage and the best all-around rider (so far) is in yellow. Great day of racing. Thanks for the early wrap inrng! I’ve had this creeping feeling throughout the day that this is what has happened. No one from the Sky camp seemed surprised in the post-race interviews, and they all their their positive lines about “all for Porte” ready to go. From Froome’s face coming out of the doctors van last night, I get hte feeling they already knew the game was up, and Froome only started today out of respect for him as team leader and his drive to continue. I wonder what impact this must have psychologically, on top of a pretty horrid injury? It’s been reported that Froome *started* the stage with a fracture. Well picked up, that’s exactly how I saw it played out. Froome is battered and bruised on the team bus, even Brailsford sees the stupidity in throwing good money after bad. Richie is not backward in coming forward too, he’s got big ambitions and is quite prepared to say so. Too many people are happy to say Porte is now team captain as if he’s at the wheel of a new Ferrari. With Froome gone, G-Thomas having a bad record in staying upright, and the rest of the team possibly licking their wounds or wondering what next, Porte has inherited a clapped out old bus. Don’t forget Richie’s already had a crash in this Tour. If he places top 5 in the final GC it’ll be a phenomenal effort. Contador is sitting pretty with the whole team and game plan still focussed around him. Porte crashed today as well, his Knicks were shredded on his left side. If so (and it is plausible): why did Froome even start? Really, why? We’ve only had once source for this and others say no. I think today was the best stage for many years. The tour has stages for time trialers, sprinters and climbers. This was one for the hard men to shine and made it interesting. Nibali showed he had inner hardness today and I loved it. It should be a feature of the tour every year. It has created gaps which make it interesting for the fans. The winner of the tour should be the best all rounder in my opinion. Mountain goats and testers should not get a monopoly on being able to open up gaps. It doesn’t have to be roubaix every year, but the organisers should look to throw in as many stages that the lightweights fear. It adds excitement, which is sometimes lacking recently. Best stage since the 2011 Time Trial on Stage 20, as there was a lot of suspense building up to the Evans ride to overtake Andy. Has the Tour de France ever used the roads/paths of the Tro Bro Leon? This could be a very rich alternative to the cobbles of the north of France, and Brittany loves a bike race. Shut up and take my money Dylan. No. It could be an idea for the future. There are also other possibilities with unpaved cols and “strade bianche” style roads in the South of France if needed but it’s likely to be avoided for now. Such a good idea. Would be a great promo for Tro Bro Leon as well. That race deserves more attention and better riders. Put it on the World Tour. Wiggins has already expressed an interest in the Vuelta and now it would seem an obvious choice for Froome. Round 2 for Team Sky team selection speculation coming up. so, speculations begin. How much time is contador expected to gain on Nibali during the long time trial? A minute? Two? Two and a half? Strade bianche style roads would be awesome. It’s going to be a great tour and I think their are more surprises to come which will keep me glued to the TV. My money is on Nibali though, but contador will attack like a rabid dog. I can’t wait!!!!! Thank god for today. So true. Sports and business alike. It’s just wrong. Noteworthy: Lars Boom is a former cyclocross world champion (2008, 2007 U23); he was like a kid on Christmas morning when he was interviewed after stage 4 and informed of the conditions. Also, four wins in five stages for the two imperiled Dutch teams + millions on the roads in the UK…if they can’t find sponsors, cycling is truly #TotallyDisconnected. Astana boys must have some special letters from Vino in their musettes today. Lieuwe Westra was formerly a bricklayer making streets, so he knows his way around cobbles. He said post-race his job was to get in the break – which he did – and when Nibali and Fuglsang were on the way, to drop back, pick them up and go full gas. “GIBUS 92 92” – best graffiti I’ve seen in a while! It’s preserved now and the bridge is known as “Pont Gibus”. For those that don’t know, Gibus was the nickname of Gilbert Duclos-Lassalle, twice winner of Paris-Roubaix and arguably the Jens Voigt of his day or certainly a rider who improved with age. Duclos-Lassalle won P-R in 92 and 93, hence the markings. The Pont Gibus is about 92km from the velodrome on the traditional course. the story of sagan not chasing nibali because he is a friend is a total stupidity sagan said… please stop to pay credit to what a “sure” winner says to justify “losses”. Not a Froome fan but felt for him today, not sure Wiggo would have liked it either. Sky must have known about their leader last night, never really looked like they wanted to support him. All to ride for, exciting times. Well deserved win by Boom, Belkin rode a strong race and clearly marked this stage! I thought it wasn’t just Nibali riding really good as a GC contender, but Astana’s tactics were also superb, putting a strong lieutenant as Westra in the break. He did a lot of work together with Fuglsang. Clearly they did not fear this stage like other teams might have. Was that Van Den Broeck going over his handlebars at one point? That’s one way to address your anonymity if it was. I think it was Lars Bak who somersaulted into the ditch. 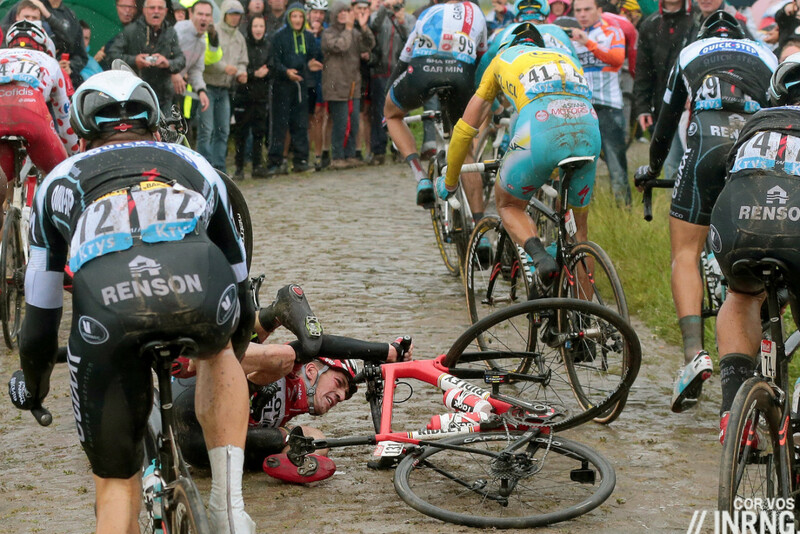 Yes, Bak did the spectacular crash while JVDB crashed in the middle of the cobbles (picture above). In that case, despite the photo evidence above, I choose to continue in my belief that he isn’t really a pro cyclist, but a rebranded ‘virtual partner’ on all the riders’ Garmins. Never visible, but always in the top ten. Looking ahead is the descent off the Port de Bales on stage 16 the same as 2012? That could be some spectacle. Nibbles is immense when the going gets grim. Great stage, diversity builds character GC is just what it means a man for all seasons. blown up and still time for others to rise to the top. Thanks inrng broken laptop, and all sure you did not just get mud on it? You’re truly a GC blogger broken computer did not stop you, you must be with NetApp? I am not nor was I ever really a fan of Armstrong. However, looking at the last few years of the Tour; Evans’ busted elbow in 2010, Wiggins’ broken collarbone in 2011, Froome’s hand this year, the fact that Armstrong – pharmacology aside – managed to win seven straight titles says a lot about his team and his good fortune to avoid any serious injuries. always overlooked because to raise the point now gives the appearance that the pharmacology was “acceptable” and also not entirely responsible for the victories. 7 years is a long time to have lady luck on your side – drugs be damned. You are right – You can dope to the gills but to never crash hard enough to break something, race ending injury or mistimed flat is worth giving credence to the good fortune and the team he had (doped up as they were too). It helps having the UCI helping you onto the podium by never testing positive. Even ASO altered the route to better please Armstrong. Somehow these important details are easily forgotten. I just lost so much respect for Teejay van Garderen. His post race interview was depressing. To call out the ASO and basically say there is no space for cobbles (or rain and wet roads) is a joke. How many amateur racers throughout the world, pay their own money and often ride in these conditions? Yep, that was pretty weak. I’ve always given him the benefit of the doubt and chalked it up to not being overly comfortable with the media and answering questions, but he rubs me wrong and that sealed the deal. Now that I've had a chance to cool off, I'd like to apologize for what I said to NBC. Today was an epic day of bike racing!!! You have to give these guys a window post-race. They’re tired, pissed off, with low blood sugar. Everything can seem bad when you’re in that kind of a mood. Look at Cavendish in the wake of a defeat. He’s often petulant and obnoxious, but given a bit of time, self awareness kicks in and he can be one of the best interviewees. least we all forget that he is 24-25 Yrs old. First time TDF team GC guy wearing the weight of “Boulder Co” around his neck, as well as the 3-4 million US race fans as one of its rising cycling stars. Sorry – but that does not somehow make his comments better. His true “expectation” of what a Pro Rider should have to endure came through. He seemed like a spoiled, petulant person, who, did not like the fact that route was difficult in a way that put him out of his comfort zone. I do not respect that kind of rider, no matter what the age. He is an adult, not some U-17 amateur. Sorry – but age has nothing to do with it. It is his nature. That tweet has all the smell of a corporate response influenced by team bosses. as a fan, i would love a cobbled stage every year. maybe a trade off with a flanders style course one year and roubaix the next? or to keep it mixed up, how about a sampling of all 5 monuments one year at a time? i understand why the riders don’t want these stages,and i don’t think they are less hardmen as a result. but what we fans want isn’t necessarily the spectacle of carnage, it’s a way to break up the race early to allow for attacking racing and risk taking. if the riders can think of an innovation that does just that without putting them on the pave, then i’d be satisfied. otherwise give me a cobbled stage each year! I always think of the Tour as being a kind of ‘best of’ the rest of the cycling year – like an introduction to pro cycling for those who have only a casual interest. We have days for time trialists, days for climbers, a whole competition for the sprinters and then ideally you’d have something for the classics guys as well. They’re often sold short. Plenty of people will watch only in summer and be baffled why so-and-so’s a big deal because the rider in question isn’t given a chance to show their strengths. It wasn’t so much the cobbles that made the day, it was the weather. I’ve never seen so many riders failing to grab bottles successfully. It was like they were deliberately trying to smash them out of the soigneur’s hands! Who was the rider the TV pictured riding-up to the team helper at the end of the cobbles, ripping-off his filthy sunglasses and flinging them into the grass, only to be handed-up a bottle ? He rode away looking back questioningly over his shoulder – obviously wanted some new specs he could see through, chucked away the old ones, didn’t get a new pair and was going to have to face the next section getting muck into his eyes as well as his face ! It was one of the Belkin guys – maybe Sep Vanmarcke? They weren’t hanging around today either, 155km in 3hrs20. Ouch! There was a strong wind from the north which would have pushed them on. It probably also helped the race to fragment so much. Perhaps when the cap/sock donation system is up you can stretch to a new laptop. I’m sure I’d contribute, given the deep sadness I felt at the prospect of a morning without a stage preview! It was obvious that Froome’s wrist injury, was much worse than anyone let on, after Tuesdays prang. That’s a normal course of conduct for a GC team, to keep it quiet, of course. Riders make the race. If the course included riding over upturned bricks, so what. Get on with it, it’s part of the stage. All this “Health & Safety” b/s will neuter the sport. Yes, I know the balance of rider safety, but keep it in perspective. Whinging because rider A, can descend faster down wet roads, or rider B rides over cobbles like they don’t exist, is as valid as the scrawny rider C, who goes uphill faster than rider A, cause he weighs less. transfixed watching the stage, don’t like to see one of the main GC contenders crash out but for me the real highlight was the seemingly effortless way Nibali appeared to float along. Amazing to watch. When crashes happen so often it’s not bad luck, maybe the team and the DS do not protect their team leader as well as they should but when push comes to shove (pun intended) you have to have the bike handling skills and the confidence to stay upright.Froome’s bike handling is not up to par *for a GC contender* sorry but my harsh comments of yesterday (before his abandon) still stand. Sorry to rain on all the comments of adulation for Astana and Nibali. Sometimes when the describing words unbelievable, float, surprising, or outstanding are throw about, I find my auto caution system activates. It was indeed an heroic, exciting and outstanding stage, and has probably done much for greater understanding of the demands and toughness of our sport. In view of this, it is a shame to hear riders, the same old culprits led by Cancellara, complaining saying it was not a stage for the TdF. If these winging buggers had ridden in northern France or Belgium in the not so distant past, they would understand the historical context. I found it a little odd to hear Dave Brailsford describe Nibali’s ride as ‘unbelievable’ on the Humans Invent/Telegraph/Jaguar Cycling podcast. Probably didn’t mean anything by it but it’s a loaded adjective for me. Yes, its up there with “preparation” as a loaded term. Deliberate remark or just an English superlative that rolled off the tongue? Hard to know. I don’t think it was a loaded term. Brailsford is a long time fan of Nibali – originally he was earmarked to lead Sky before Wiggins became a possibilty. There were more crashes on the wet roads than there were on the cobbles yesterday. I think one of the riders said they had lowered the pressure of their tyres to cope with the cobbles which made the handling very different and difficult leading to punctures – this seems slightly counter-intuative to me though. I think low pressure tyres would have made high-speed roundabouts in the wet tricky. I’m no pro or pro mechanic I can’t help thinking this was a factor. Interesting to see your comment on the Belkin team. I was wondering the same thing. Still, a stage win in the Tour is a big thing, especially for a team still looking for a sponsor, and the heroism of this stage only adds to this. They had other fine specialists like Wynants and Tjallingii looking after Mollema, so you could argue that the depth of the team allowed Boom and Vanmarcke to make a push for the stage win, as Boom and Vanmarcke would have had to hold back significantly in order not to drop Mollema. And apart from Nibali, the GC contenders are still all within a minute of each other. It’s good publicity for the team and Belkin and if they have a sponsor or two it could swing or accelerate things – no Dutch stage win in the Tour since 2005 – but otherwise it’s unlikely to get corporates picking up the phone. It seems that after every race that takes place on unconventional surfaces, it leaves fans craving for more. That’s the future, surely. Kudos to Cyril Lemoine for being up at the front of the race all day and placing in the top 10, rather than hanging back to save energy to attempt to keep the KOM jersey for a few more days. He’s placed in the top 10 twice in Tro-Bro Leon in the past so I’m sure he’d be up for including them in a future Tour. Proof that these stages have their place in the Tour was that in the end of the stage, when Eurosport was doing a kind of “flash interviews” to riders just arriving, they were smiling and just saying “Epic stage, proud to have done it”. If you have to exceed yourself just to make it to the end, it’s the Tour. Nibali was riding the pavé like a true specialist, loved his attitude during the stage. Gentlemen, we have a race! I know right, he was offered about three different bikes as well! Not the biggest fan of froome dog, but shame to see him go out like that (i.e. yesterday’s unlucky crash). They say to be the best you have to beat the best, was really looking forward to froome vs contador. But what a wonderful stage, both in isolation and for how it has spread the contenders. Has Nibali been linked to PED use? Need to know the answer before I think about supporting him. Only by those who assume that any GT winner must be on something. Given the way he has faded in the 3rd week before, and the fact that his whole pro career has been post the introduction of the biological passport, there are reasons to be cautiously optimistic. I believe he threatened to sue somebody for suggesting he’d worked with Ferrari before. He has not been implicated in any investigations before. No known relations to shady doctors either. Some may point out that he did ride with diLuca at Liquigas before. Some may also point out his extra wonderful performance in a few grand tours. But that would be 2+2=11. I see a couple of guys finished more than 30mins off the back – what would the cut-off be for a stage where the winner finishes in 3hrs 18 mins? On this day and with the average speed it works out at 22% of the stage winner’s time or about 44 minutes. I’m a big fan of the Paris-Roubaix so found yesterday’s stage fascinating to watch. I’d push for cobbles to be included on a regular basis in the Tour as it does add to the variety and could potentially increase the pool of riders that could have a crack at GC who might not get a look-in due to being either weaker in the mountains or in TTs. It might also mean more big name boys might bother turning up to Paris-Roubaix rather than leave it to the specialists which would be a big boost to the Hell of the North. fair enough, but “L’Enfer du Nord” doesnt really need a boost. its gigantic the way it is. I don’t know. I don’t think a single gc guy did roubaix this year even though they all knew about the cobbles. And I agree with Mr inner ring that the cobbles are something to be used sparingly. Use them too often and they loose their fearsomeness and novelty. If you use them every five or six years, you’re practically guaranteed a great race. Vincenzo Nibali has to be the most underrated rider in the sport. This guy won the 2o13 Giro! And, he did it with a splendid time trial, even though he was already one of the world’s premier climbers. He’s shown the willingness to work on all needed cycling skills, and Stage 5 was just the latest demonstration of this dedication. When was the last time we saw the yellow jersey actually leading a stage not going uphill?! Contador and others are going to have their hands full catching him! He’s a great rider from the start an obvious pick for the podium so hopefully not many people underestimate him. If anything his lead now means he doesn’t have to go on bold raids and assume the risk of of losing, instead that’s for others to do. Bold raids are part of what makes Nibali so likeable (plus he comes across as pretty eloquent and smart off the bike too) so lets hope he finds them hard to resist! But Astana are in pretty good shape having Fulsgang at no. 2 as well. Looking forward to the mountain stages now. Nibali can climb very well but dont think he has got that killer kick of Contador. Also is it me or is Geraint Thomas is becoming a very likeable rider on and off the bike this year? Thomas is often self-deprecating and amusing. As for Nibali, it doesn’t come across so easily but he’s a millionaire living in Switzerland who hasn’t changed much, he still comes across as an ordinary guy from Italy. Great performance from Nibali, one which also sets us up for a fantastic remainder of the race! Anyone who thinks this Tour is over (not that anyone here has said they do) only needs to look at this year’s Giro from Stage 12 to 16 to see how quickly things can be turned on their head in the mountains! Looking forward to the tactics and drama already. Come on, nobody loved “phobia of the porphyry?” line was great. Personally Froome was never my favorite, agree with the nice words about Nibali, and what’s up with Spartacus, never heard him whine so much. I don’t think we’ve been set up for a boring tour, rather the opposite with Contador fighting for time on stages you might not expect. Are cobbles out of place at the Tour? No. Stage 5’s “instant classic” status proved the Tour can be very dramatic and uncontrolled. Let’s have one in every Tour, so riders can get used to them. If they know there’s one every tour, they’ll be better prepared. It will less nervous and less dangerous. Sorry to Chris Froome, but that’s racing. With him out, the race is much more exciting. I’m really looking forward the racing in the hills! The Shark v El Pistilaro will be an amazing duel. And we can’t forget all the guys like Valverde, the Americans, and the usual surprise riders breaking through. Is there nobody who finds it strange that Froome didn’t even try to get back on his bike, despite apparently having no serious injury? Of course we’ve gotten used to guys riding on with broken bones and the likes, which might not be a good idea. But still, this race is his big goal of the year. I think a determined pro rider should at least try to finish the stage and see afterwards if it’s possible to continue the next day. It was very strange, but so are alien invasions. I’m pretty sure a broken/fractured wrist is serious though. Can someone explain to me how Stage 5 was completed in an average speed of 47 km/h over cobbles, and in the rain?